You can use Dreamweaver to build a set of pages to let users search your database and view the search results. In most cases, you need at least two pages to add this feature to your web application. The first page is a page that contains an HTML form in which users enter search parameters. Although this page doesn’t do any actual searching, it is referred to as the search page. Optionally, you can add a detail page. A detail page gives users more information about a particular record on the results page. If you have only one search parameter, Dreamweaver lets you add search capabilities to your web application without using SQL queries and variables. Simply design your pages and complete a few dialog boxes. If you have more than one search parameter, you need to write a SQL statement and define multiple variables for it. Dreamweaver inserts the SQL query in your page. When the page runs on the server, each record in the database table is checked. If the specified field in a record meets your SQL query conditions, the record is included in a recordset. The SQL query in effect builds a recordset containing only the search results. For example, field sales staff might have information about customers in a certain area who have incomes above a certain level. In a form on a search page, the sales associate enters a geographical area and a minimum income level, and then clicks the Submit button to send the two values to a server. On the server, the values are passed to the results page’s SQL statement, which then creates a recordset containing only customers in the specified area with incomes above the specified level. A search page on the web typically contains form fields in which the user enters search parameters. At minimum, your search page must have an HTML form with a Submit button. To add an HTML form to a search page, complete the following procedure. Open the search page or a new page, and select Insert > Form > Form. An empty form is created on the page. You might need to enable Invisible Elements (View > Visual Aids > Invisible Elements) to see the form’s boundaries, which are represented by thin red lines. Add form objects for users to enter their search parameters by selecting Form from the Insert menu. Form objects include text fields, menus, options, and radio buttons. You can add as many form objects as you want to help users refine their searches. However, keep in mind that the greater the number of search parameters on the search page, the more complex your SQL statement will be. Add a Submit button to the form (Insert > Form > Button). (Optional) Change the label of the Submit button by selecting the button, opening the Property inspector (Window > Properties), and entering a new value in the Value box. Next, you’ll tell the form where to send the search parameters when the user clicks the Submit button. In the Action box in the form’s Property inspector, enter the filename of the results page that will conduct the database search. GET sends the form data by appending it to the URL as a query string. Because URLs are limited to 8192 characters, don’t use the GET method with long forms. POST sends the form data in the body of a message. Default uses the browser’s default method (usually GET). The search page is done. When the user clicks the form’s Search button, the search parameters are sent to a results page on the server. The results page on the server, not the search page on the browser, is responsible for retrieving records from the database. If the search page submits a single search parameter to the server, you can build the results page without SQL queries and variables. You create a basic recordset with a filter that excludes records that don’t meet the search parameter submitted by the search page. If you have more than one search condition, you must use the advanced Recordset dialog box to define your recordset (see Build an advanced results page ). Open your results page in the Document window. If you don’t have a results page yet, create a blank dynamic page (File > New > Blank Page). Create a recordset by opening the Bindings panel (Window > Bindings), clicking the Plus (+) button, and selecting Recordset from the pop‑up menu. Make sure the simple Recordset dialog box appears. If the advanced dialog box appears instead, switch to the simple dialog box by clicking the Simple button. Enter a name for the recordset, and select a connection. The connection should be to a database containing data you want the user to search. In the Table pop‑up menu, select the table to be searched in the database. In a single-parameter search, you can search for records in only a single table. 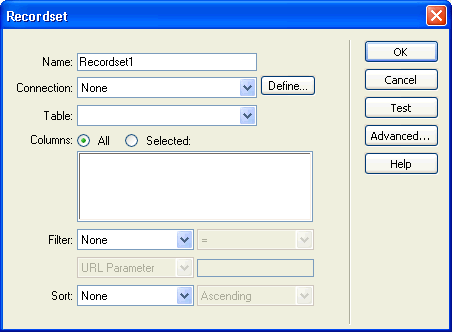 To search more than one table at a time, you must use the advanced Recordset dialog box and define a SQL query. To include only some of the table’s columns in the recordset, click Selected and select the desired columns by Control‑clicking (Windows) or Command-clicking (Macintosh) them in the list. You should include only the columns containing information you want to display on the results page. Leave the Recordset dialog box open for now. You’ll use it next to retrieve the parameters sent by the search page and create a recordset filter to exclude records that don’t meet the parameters. From the first pop‑up menu in the Filter area, select a column in the database table in which to search for a match. For example, if the value sent by the search page is a city name, select the column in your table that contains city names. From the pop‑up menu beside the first menu, select the equal sign (it should be the default). From the third pop‑up menu, select Form Variable if the form on your search page uses the POST method, or URL Parameter if it uses the GET method. The search page uses either a form variable or a URL parameter to pass information to the results page. In the fourth box, enter the name of the form object that accepts the search parameter on the search page. The name of the object doubles as the name of the form variable or URL parameter. You can get the name by switching to the search page, clicking the form object on the form to select it, and checking the object’s name in the Property inspector. (Optional) Click Test, enter a test value, and click OK to connect to the database and create an instance of the recordset. The test value simulates the value that would otherwise have been returned from the search page. Click OK to close the test recordset. If you’re satisfied with the recordset, click OK.
A server-side script is inserted on your page that checks each record in the database table when it runs on the server. If the specified field in a record meets the filtering condition, the record is included in a recordset. The script builds a recordset that contains only the search results. The next step is to display the recordset on the results page. For more information, see Display the search results . If the search page submits more than one search parameter to the server, you must write a SQL query for the results page and use the search parameters in SQL variables. If you have only one search condition, you can use the simple Recordset dialog box to define your recordset (see Build a basic results page ). Open the results page in Dreamweaver, and then create a recordset by opening the Bindings panel (Window > Bindings), clicking the Plus (+) button, and selecting Recordset from the pop‑up menu. Make sure the advanced Recordset dialog box appears. The advanced dialog box has a text area to enter SQL statements. If the simple dialog box appears instead, switch to the advanced dialog box by clicking the Advanced button. Enter a Select statement in the SQL text area. To reduce the amount of typing, you can use the tree of database items at the bottom of the advanced Recordset dialog box. For instructions, see Define an advanced recordset by writing SQL. For help on SQL syntax, see the SQL primer at www.adobe.com/go/learn_dw_sqlprimer. Give the SQL variables the values of the search parameters by clicking the Plus (+) button in the Variables area and entering the variable’s name, default value (the value the variable should take if no run-time value is returned), and run-time value (usually a server object holding a value sent by a browser, such as a request variable). In ColdFusion, the run-time values would be #LastName# and #Department#. In PHP, the run-time values would be $_REQUEST["LastName"] and $_REQUEST["Department"]. (Optional) Click Test to create an instance of the recordset using the default variable values. The default values simulate the values that would otherwise have been returned from the search page. Click OK to close the test recordset. The SQL query is inserted in your page. The next step is to display the recordset on the results page. After creating a recordset to hold the search results, you must display the information on the results page. Displaying the records can be a simple matter of dragging individual columns from the Bindings panel to the results page. You can add navigation links to move forward and backward through the recordset, or you can create a repeating region to display more than one record on the page. You can also add links to a detail page. For more information on methods of displaying dynamic content on a page other than displaying results in a dynamic table, see Displaying database records. Place the insertion point where you want the dynamic table to appear on the results page, and select Insert > Data Objects > Dynamic Data > Dynamic Table. Complete the Dynamic Table dialog box, selecting the recordset you defined to hold the search results. Click OK. A dynamic table that displays search results is inserted on the results page. Your set of search and results pages can include a detail page to display more information about specific records on the results page. In this situation, your results page also doubles as the master page in a master-detail page set. You can create a link that opens a related page and that passes existing parameters to that page. The server behavior is only available when using the ASP server model. Before adding a Go To Related Page server behavior to a page, make sure the page receives form or URL parameters from another page. The job of the server behavior is to pass these parameters to a third page. For example, you can pass search parameters received by a results page to another page and save the user from entering the search parameters again. Also, you can select text or an image on the page to serve as the link to the related page, or you can position your pointer on the page without selecting anything, and the link text is inserted. In the Go To Related Page box, click Browse and locate the related page file. If the current page submits data to itself, enter the current page’s file name. If the parameters you want to pass were received directly from an HTML form using the GET method, or are listed in the page’s URL, select the URL Parameters option. If the parameters you want to pass were received directly from an HTML form using the POST method, select the Form Parameters option. When the new link is clicked, the page passes the parameters to the related page using a query string.